The Jessie Peterman Library presents Program: Coping and Coexisting with Coyotes on Saturday, February 23, 2019. 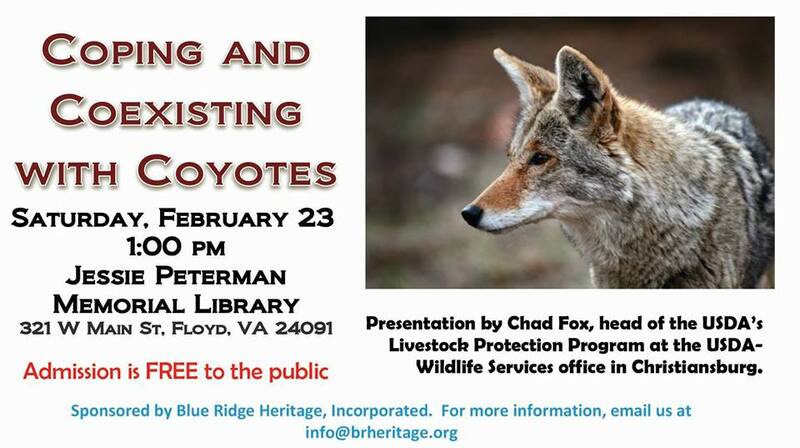 Chad Fox, head of the USDA’s Livestock Protection Program at the USDA-Wildlife Services office in Christiansburg, will be here to give a talk on coyotes. Mr. Fox’s presentation will cover a variety of topics concerning coyotes including methods for dealing with them to protect livestock and preventative measures. The event is sponsored by the Blue Ridge Heritage, Inc.
To view the event flyer, visit: https://i.imgur.com/V5yiWbY.jpg.